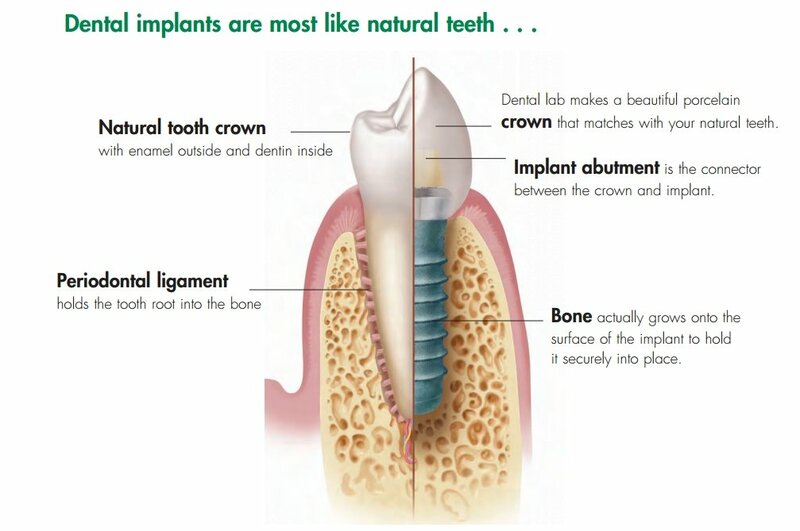 Many people have heard of dental implants, but not everyone knows what they are or if they are suitable for them. Here at Bridge Dental Clinic, we want to help you understand the basics so that you can decide if you’d like to speak to us about having them fitted. A dental implant is an artificial tooth which is connected into the jaw bone using a tiny, but very strong, titanium screw. These implants can also be used to provide support to other loose dentures, and in so, aid to giving you back a better quality of life. With the loss of a tooth, your dental structure is changed and this can have a knock-on effect on other teeth which can shift or tilt due to the gap. This knock-on effect could lead to further loss in the future and so it’s wise to get a consultation now, to help alleviate any future problems. If you’ve already got a missing tooth then you probably know how painful it can be when a hard bit of feed comes in contact with the gap in your teeth – ouch! Filling this gap with a dental implant can mean an end to that daily suffering and mean you can star to enjoy all those foods you’ve been avoiding. Another issue suffered by those who have lost a tooth is the negative impact on your quality of life through a loss of confidence or a sense of embarrassment. Getting a dental implant and returning to your ‘old’ smile can bring about a transformation and reduce any of the stress that you were feeling. Choosing whether dental implants are for you is a big decision. If you are considering a new smile or having teeth fixed with implants, it is vitally important to understand what can be done for you and the whole process that will take you from start to finish. We are here to hold your hand, make you feel comfortable and ensure you get the best possible end result in as quick and painless a time as possible.